Leek ended their league campaign with a thrilling encounter against Veseyans who had to win to stand any chance of survival. Leek outscored their visitors by 7 tries to 5 in a game that see -sawed all afternoon and was a fitting end to the 18/19 season which, although disappointing from a league table point of view, still saw Leek score 73 league points against 72 points last season. Jack Newton Taylor, Adam Varley and Joe Cooper was Leek's back 3 with Tom Scragg and Nick Palmer in the centre. Sam Hunt and Ollie Drew were at half back. Joe Newton Taylor, Ed Cheadle and Bobby Cheadle, the backbone of the side, started in the front row with Luke Hardern and Ben Barlow at lock. George Hunt was back on the flank and together with Joel Booth and Billy Kidd made up the back row. Lewis Dunleavy, Tom Fairhurst and Isaac Reaney were on the bench. It took Leek 3 minutes to open the scoring after good forward play by the locks Ben Barlow and Luke Hardern took the ball into Vs half. Then Joe Cooper sprinted into the Vs 22 on the left and after setting up the ruck Jack Newton Taylor was on hand to score. Sam Hunt converted and Leek led 7-0. George Hunt looked to have scored Leek's 2nd try on 8 minutes but the referee saw an accidental offside in the move. Leek's scrum then shoved Vs pack near their line but was penalised for driving up. The resulting kick and lineout to Vs on their 10 metre led to the centre scoring under the posts after taking a short pass at pace and breaking tackles. The conversion was good and it was 7 all with 11 minutes gone. 2 minutes later and Nick Palmer scored on the right after Leek kicked the loose ball into the Vs 22 on the left. The clearance kick only found Jack Newton Taylor who fed Nick Palmer and he went on an arcing run around the defence to score on the right. The conversion missed but Leek led again 12-7. Vs kicked a penalty on 19 minutes after Leek was penalised for in at the side of the ruck, 12-10 but on 23 minutes Leek scored their 3rd try after a break on the right by Tom Scragg. A forward pass then gave Vs a scrum but then they knocked on and from Leek's scrum Jack Newton Taylor scored his 2nd try beating 3 men to score in the left corner. The conversion missed but Leek led 17-10. 3 minutes later and Jack completed his hat trick. This time popping up on the right from the kick off which Leek retained. Nick Palmer made the break and Jack Newton Taylor scored untouched. (see attached touchdown). Sam Hunt converted and Leek led 24-17 with a bonus point already secured. It looked like Leek would run away with the game at this stage but far from it as the visitors hit back with a converted try on 33 minutes after a penalty gave then the opportunity for a 5 metre lineout and the catch and drive was Leekesque in its execution. The conversion was good. 24-22. Then on the stroke of half time after winning a penalty on their own 5 metre line, a deft chip over the Leek backs left the Vs centres in the clear and Leek were penalised at the ruck for slowing the ball. The excellent Vs fly half then struck the penalty to end the half and unlikely as it may have once looked Vs led 24-25. Game on. The Vs backs were proving to be an excellent unit and Leek were playing with width as well so with the game being so open it was no wonder that the 2nd half would see another 6 tries. It started on 45 minutes with Leek edging back into the lead from a lineout on their own 10 metre line. The ball was passed quickly and Jack Newton Taylor spotted the gap as he came into the line and for the 2nd week running he scored his 4th try under the pots. Sam Hunt converted . 31-25. Back came Vs 3 minutes later as they took advantage of a Leek dropped ball running out of defence and quickly took possession and score easily. The conversion was good and Vs retook the lead at 31-32. On 51 minutes Leek then played some more traditional rugby for them. Winning a penalty Hunt kicked superbly for the 5 metre lineout on the left but a knock on gave Vs the scrum. A huge drive from Leek saw Tom Fairhurst secure the ball on the ground and as Leek worked the ball right, Vs defence was penalised for slowing the ball under the posts. The Vs No.8 was yellow carded and Sam Hunt kicked the penalty to nudge Leek back into the lead at 34-32. On 57 minutes a Vs penalty for in at side of ruck gave them a simple chance to take the lead but inexplicably the attempt went wide but 3 minutes later at the end of the 3rd quarter Ollie Drew strayed offside at the scrum and this time the penalty was converted for Vs to lead 34-35. On 66 minutes, good play by Ollie Drew making a blind side break allowed Adam Varley to get into the Vs 22 on the right. The ball came back left and with the Vs defence sucked in the overlap provided the opportunity for Nick Palmer to score his 2nd try near the posts. Sam Hunt converted and Leek led 41-35. The decisive score was next as Leek piled on the pressure in the Vs 22 on 72 minutes. Courageous defence by Vs pack initially held Leek and as the prop took a head injury the referee spotted another Vs forward not moving away from the ruck and Ollie Drew's quick thinking saw him tap and go and score Leek's 7th try on the left. Sam Hunt's superb conversion saw Leek lead 48-35 and surely that was game over. No, as the spirited Veseyans came storming back and with an interception on the right play was taken to Leek's 22 with some great rucking. The ball passed wide left and the wing came inside on a great angle to score his side's 5th try. The conversion was good and after 78 minutes it was 48-42. Leek then controlled the ball for the remaining 3 minutes to win this exciting, all attacking game. As it happened, even if Veseyans had won they were still relegated as Stafford won comfortably at Spartans to secure their Midlands 2 standard for next season at their new ground on Doxey Marshes. In the other important fixture for the playoff spot, Wolverhampton were well beaten at Camp Hill allowing Tamworth to clinch 2nd place with a win at Newcastle. Leek 1sts has one more game this season and that is the Staffordshire intermediate Cup Final on Sunday May 5th at Walsall during the President's Day festival. It's the main final on the day and everyone is invited to come and support the Moorlanders in their quest for some silverware this season. It's 13 years since they last made this final losing to Burntwood at Handsworth on that occasion. Their opponents are either Newcastle, the current holders or Walsall the hosts. Their semi-final is to be played by the end of April. 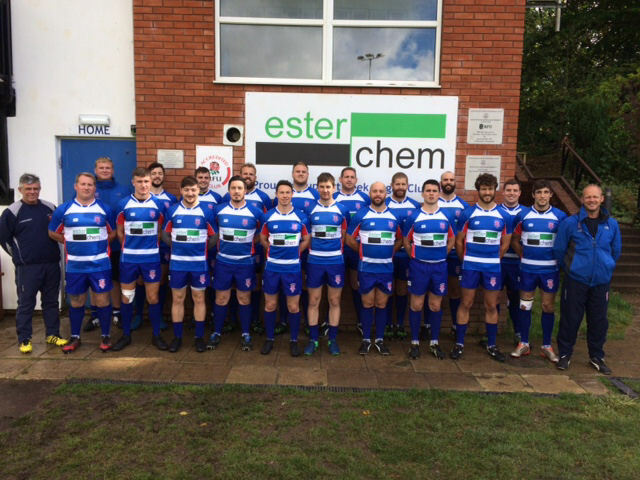 Leek 2nds also has gained promotion following their win on Saturday and will also play in their cup final on Saturday May 4th at Oldham RFC against league winners Sandbach 3rd. It should be close match. Thanks for all the support of the club this season and we hope you have enjoyed the season. The players will be looking for a well-earned rest before the start of the 2019/20 season in September.